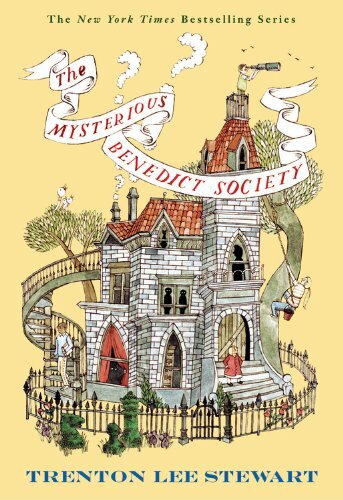 The Mysterious Benedict Society is one of those books that I’ve known about all of my life and always wanted to read, but never gotten around to actually reading it. Until a few weeks ago, however, when I was in the school library looking for a different book and stumbled on this one a few shelves over. I checked it out on a whim, and my expectations were not disappointed. It’s definitely a keeper! When this peculiar ad appears in the newspaper, dozens of children enroll to take a series of mysterious, mind-bending tests, but just four very special children will succeed. Their challenge: to go on a secret mission that only the most intelligent and resourceful children could complete. To accomplish it they will have to go undercover at the Learning Institute for the Very Enlightened, where the only rule is that there are no rules. This book, although written for children, is by no means a simple story. It bends your mind and engages your emotions, and is full of complex themes. The plot is such a unique twist on the basic “man wants to take over the world” science fiction story; the beginning is a little slow, but once you get into it, you can’t get out. There are a lot of instances where a seemingly small little thing mentioned earlier in the book factors into a bigger plot point later on; that kind of thing is my favorite! The setting is so memorable. The Learning Institute for the Very Enlightened is very well-developed, with every aspect of it used to make it seem more sinister and confusing. And the characters! Reynie Muldoon, the puzzle-solver; Sticky Washington, the walking encyclopedia; Kate Wetherall, the handy-girl; and Constance Contraire, the tiny, stubborn girl with a not-so-tiny secret. They are all so different, and yet so perfect together, and all of them have significant growth over the course of the book, a feat in itself for this many main characters. The writing style is simple, like you would expect of a children’s book, but still high-quality and interesting. All of this is not to mention the constant riddles, tests of wit, and clever schemes that keep you constantly on the edge of your seat. Being a children’s book, there is no inappropriate content or language. However, there are a few scenes that could scare very young children, and the general themes of the book are probably better for a slightly older audience. Therefore, I recommend it for ages 10 and up. Absolutely! Despite being a children’s book, I think teens and even adults will enjoy this book just as much as a kid will, if not more so for being better able to understand the themes and riddles that surround it. So if you missed out on this one as a kid, it’s not too late to get a copy and enjoy it! What do you think? Have you read The Mysterious Benedict Society? Did you like it? If not, do you plan to read it now? Also, have you read the other books in the series? How are they? Tell me in the comments below! Why Do We Dress Modestly? I’ve seen this book in the hands of many and the cover art did intrigue me. Perhaps I’ll pick it up… I simply just need to travel through nineteen exams. Anyone have a time machine? I love the Mysterious Benedict Society!! Even though it’s a children’s books, it’s still one of my favorites. And you’re right about it not being just a simple book, but with complex themes. Yes, it really does get you to think, in more ways than one. Definitely a favorite now! I know!! I will be getting to them ASAP! Yes! I think that is the mark of really great books: that all ages can enjoy them, even people way outside of their “target audience”. Haha yes 🙂 Constance is adorable!